Contemporary Music Worship Teams(with new start times): Participate in a student-led worship band to design worship sets, rehearse, and work with technology, all under the capable coaching of our music and worship staff. These teams will meet on Wednesday mornings beginning at 9:00am or 10:30am. Contemporary Music can be taken for a FREE elective credit by registering for MUS1585ANON or MUS1585BNON (college) or MUS5585ANON or MUS5585BNON (seminary). The Kingdom Choir: Join us Tuesday and Thursday mornings from 9:30-­10:20am in the Appleby Bethea Room. The Kingdom Choir gives students the opportunity to sing and lead each other in worship. Also, we’ll work with diverse worship leaders both on and off campus at special events. This class can be taken for a FREE elective credit by registering for MUS1581ANON (college) or MUS5581ANON (seminary). 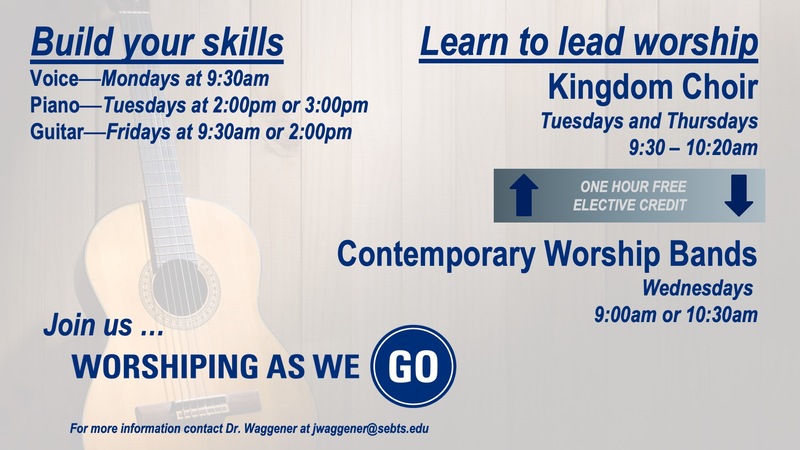 Musical Skills Classes: To lead musical worship effectively, certain skills are necessary. Consider taking voice class on Mondays, piano class on Tuesdays or a guitar class on Fridays. These classes are open to all Southeastern students. For more information, contact Professor Joshua Waggener at jwaggener@sebts.edu.